Making sure your house is friendly to children is not just about safety. You also have to make sure they can study comfortably, have easy access to any stationery or textbooks they may need, and have their own space in the house. Here is some food for thought when it comes to creating a happy household for kids. A parent’s nightmare is seeing their child hurt or injured, but it can happen in the blink of an eye and at any time. That is especially true if you haven’t taken the time to ensure their surroundings are safe, regardless of their age. Smaller children will require a different approach to safety than teenagers. Latches on cupboard doors, plastic plugs protecting unused powerpoints and limiting what they can climb on is just a start. Then there are safety issues that can be addressed that affect the whole family. This can include loose pavers, slippery floors, damaged flooring and chipped or cracked items, such as tiles and mirrors. Every home should have a RCD as well that cuts the power in the case of an electrical emergency to prevent electrocution. This is not only a safety issue but also one that ensures your children have the best environment in which to study and learn. For small children it is as simple as not leaving sharp implements or other dangers within reach of little fingers. It can also mean moving breakables out of sight or out of reach. For older children it can get a bit trickier. While they may not be able to break anything, there are temptations that come with experimentation and even rebelling. Just as you would with smaller children, keep medicines secure and also consider putting a lock on the liquor cabinet. You child may not be looking to drink alcohol just yet, but sometimes peer group pressure can be a trigger. Temptation also comes in the form of distraction. If a child is supposed to be studying, don’t put them in the same room as their gaming console! You can guess which one they would pick if they had a choice. Older children in particular need their own space. It’s not because they don’t like you, it’s just because they are growing up and are becoming more independent. If they do retreat to their bedroom, don’t barge in every 10 minutes to see if they need anything or what they are up to – it will only cause friction. 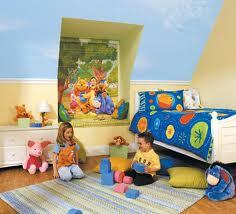 One of the best ways to give them space while also being able to keep an eye on them is to create a kids’ zone. This can be a spare room, a lounge room or even the shed. It’s a place where they can listen to music, watch television, play games or just chill out. A couple of bean bags, some toys or posters, their electronic items of choice or even a writing desk are all that’s needed. Let them pick a colour scheme or how it is set up. It will give them a place they can call their own. Without doubt the best way to create a child-friendly home is to be the best family you can. You need to make sure your children also have your support, encouragement and are there when you need them. You also need to know when to give them some space. Be involved in their activities and interests and remain positive to ensure you create the happiest household possible.